Each day, millions of Americans start the day with a cup of coffee, many calling the first cup the most important moment in their morning ritual. In total, some 400 million cups are sipped and gulped over the course of a day. Globally and agriculturally, coffee consumption, measured by 60-kilogram bags, exceeded 150 million bags in 2016, a number that’s growing each year. Notably, consumption the last two years outpaced production as population grew and coffee’s popularity continued to spread around the world. Perhaps surprisingly, the United States, number one in total coffee consumption, ranks 26th on a per-capita basis. Simultaneous to this growth, coffee production faces decline due to extreme weather events, new pest outbreaks and dwindling farmer populations. “We’re facing a precipice in coffee,” says Bambi Semroc, VP of sustainable markets and strategy at Conservation International, “where climate change is going to cut in half the areas for growing coffee by 2050.” CI foresees demand doubling or tripling in the same time frame. That’s where the Sustainable Coffee Challenge comes in. Semroc founded the program within CI, with help from Starbucks, the Global Coffee Platform and the Specialty Coffee Association, to bring sustainability into coffee production across sectors. Today, SCC has over 80 brands and organizations on board, including Rainforest Alliance, Keurig Green Mountain and Allegro alongside Farmer Brothers, Nespresso and Walmart. 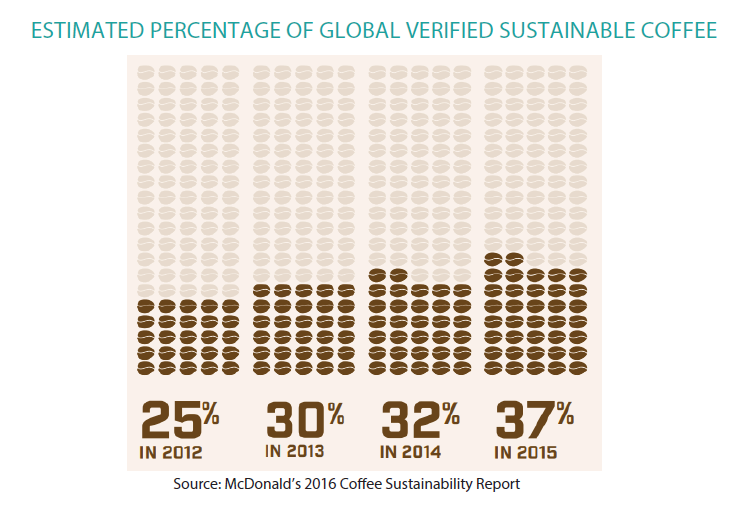 McDonald’s has pledged 100 percent sustainably sourced coffee by 2020. “Our size and global reach give us the responsibility to lead meaningful change around the world,” said Victoria Zimmerman of McDonald’s Corp. in a statement on SCC’s website. Big moves on big commodities start small. Blomquist—the former president and CEO of Spectrum Naturals who now oversees Natural Habitats USA, a grower, manufacturer, importer and distributor of organic, fair trade certified palm oil (and recipient of last year’s NBJ Mission and Philanthropy award)—knows this well. SCC built a framework of four focus areas, identifying that sustainable sourcing should improve livelihoods, conserve nature, strengthen market demand and sustain supply. Improvements in these areas will certainly have a huge value to the communities and environment in the coffee growing regions, says Blomquist. “Coffee has a very tainted history of third-world abuse that needs to be remedied. This effort also gives the growing number of consumers what they want to know about where their coffee comes from, and how the brands they buy from are taking care of the farmers, the local people and the environment,” he says. Blomquist sees a risk, here. Managing costs is the highest priority for importers to stay competitive, and the temptation to cut corners will always be there, as will the risk of greenwashing. This is where third party certification programs like organic, fair trade and Rainforest Alliance come in, he says. It’s this call for collaboration, potential pitfalls and all, that inspires the award. Last year we honored OSC2 for efforts like The Climate Collaborative for similar efforts. Internal commitment, self-monitoring and sharing of successes are key to both programs. “The Sustainable Coffee Challenge provides an unprecedented opportunity to join with others, share what we’re learning and ensure all coffee is sustainably sourced worldwide,” states Kelly Goodejohn of Starbucks on the SCC website.